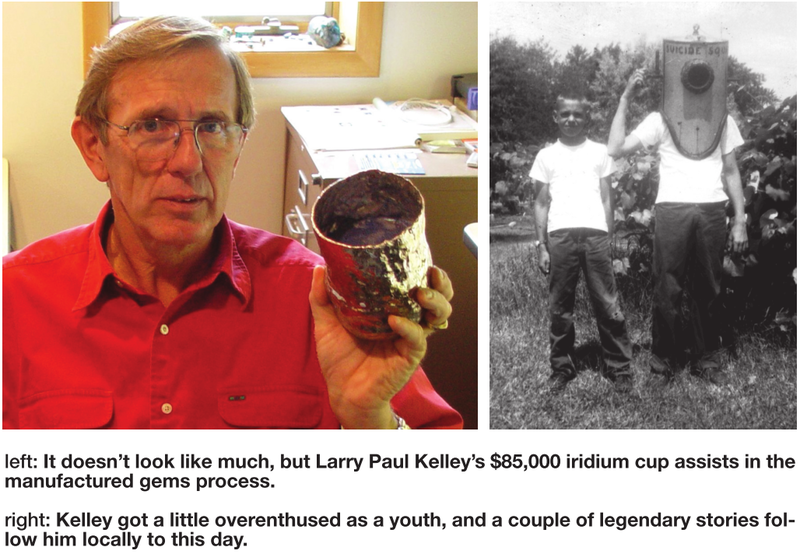 Larry Paul Kelley’s interest in science started early. His father, an auto body repairman, kept a valued collection of Popular Science magazines in the house, and Kelley would peruse them regularly. Before long, he decided to attempt a few of the things he was reading about, and the foundation for his future career - as founder of the Shelby Gem Factory just south of Ludington - would be set before he knew it. By the age of 13, Kelley had started launching homemade rockets over Hart Lake and making bombs, a process that got him in a snippet of trouble with local authorities, although his intentions were mostly harmless. By 14, he’d built his own diving helmet and was walking around the bottoms of the local lakes. And a few years later, he enrolled at U of M and finally channeled all of that scientific energy into formally studying chemistry and physics. He also spent some time working as a research chemist at Dow Chemical, where he worked in high-temperature furnace building and materials processing. 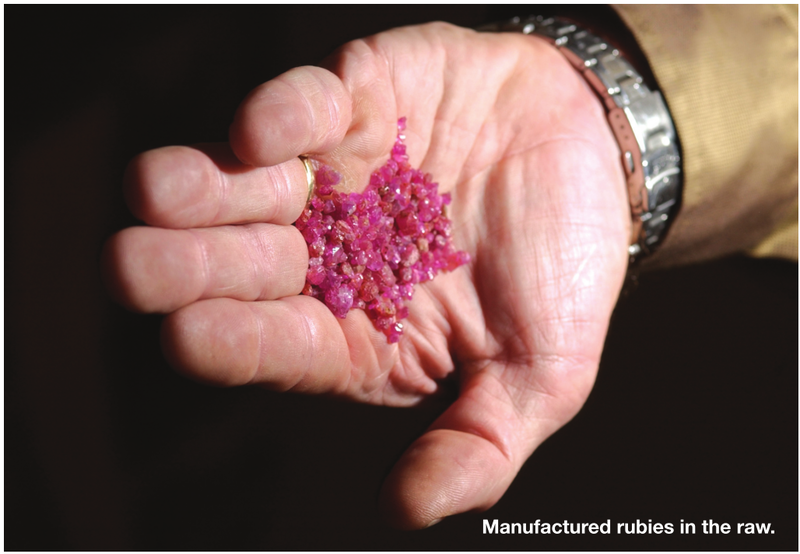 But making rubies for laser rods, while interesting, didn’t prove very profitable. So, calling once again on the science experiments of his youth, Kelley decided to cut the rods into smaller pieces and then facet them into gems. Within a couple of years, Kelley had figured out the formulas for different gems, including a clear crystal that looked much like a diamond when properly faceted (their trademarked "Diamond Encore" gem), and others that look like emeralds, topaz, citrine, and other birthstone gems. And he still hasn’t stopped trying to perfect the process to this day. The Shelby Gem Factory was founded by Kelley in November of 1970. Born in Hart, Michigan, he chose Shelby for his factory’s locale, for reasons both logistical and, at this point, somewhat humorous. Today, Kelley and his team use two main types of methods to manufacture their gem crystals. 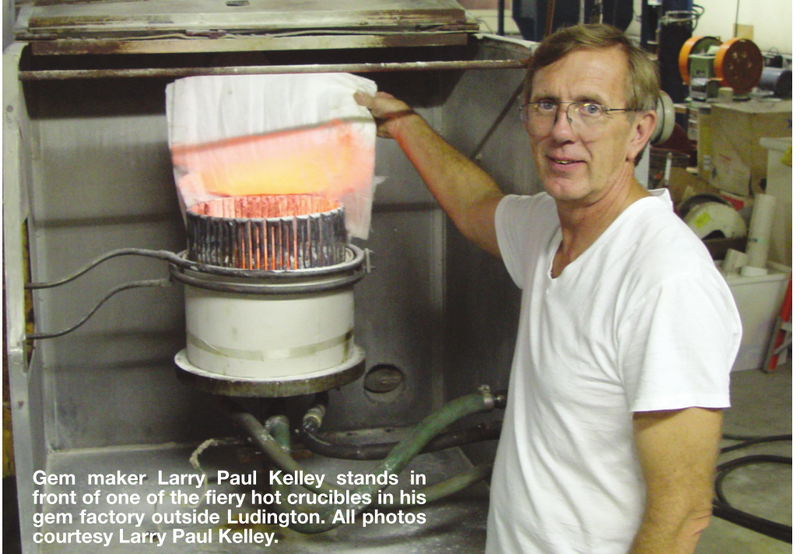 Specialty equipment from gem furnaces/ crucibles to an $85,000 iridium cup are combined by Kelley’s workers to create the gems. One method involves "pulling" the crystals using temperature differences that create the crystals in a fashion similar to the formation of an icicle. The second takes small pieces of mined gems, say ruby or sapphire, and then re-crystallizes the liquid into larger pieces of gemstone - "growing" the gems from these seeds, so to speak. Once the gems are formed, they are then cut into small pieces and skillfully faceted into the gemstone shapes that most people recognize. While Kelley used to offer a tour through the furnaces and the factory floor itself, he had to change his approach. "The insurance companies will no longer insure us if we allow people into the factory with all the very high temperatures and extremely bright light," he explains. But not much stops Kelley when he’s got a plan. He had dozens of photos of the factory interior shot so they could be put on display, crafted a mock-up of one of the gem machines ("just not as hot! " he laughs), and installed a faceting machine that people can operate to see how gem faceting works. He also built a 50-seat theater, and today utilizes that facility to put on a multimedia show that illustrates the factory process. By the middle of January 2013, the Shelby Gem Factory will have a completely updated theater presentation, to accommodate the many visitors that remain intrigued by the Shelby Gem Factory and its accomplishments. And if you see something you like, you can most likely purchase it right there at the factory’s own gem and jewelry showroom. Not only do they create and facet the gems on-site, they also create jewelry from them, unique pieces that upon casual viewing are quite indistinguishable from "the real thing. " 14 Karat gold jewelry is currently offered, with Kelley - still moving forward - adding on a second line next year that is slightly less expensive, utilizing sterling silver instead of gold. But in spite of the gem factory’s success, from its tours to the popularity of the gems, it’s always the process itself, and the science behind it, that continues to interest Kelley the most. "Of course, most ladies love the finished jewelry," Kelley says, "but I think the best part is actually the theater show. It’s very educational," he grins. The Shelby Gem Factory is located just south of Ludington at 1330 Industrial Park Drive in Shelby, Michigan. To find out more about the factory and/or tour times, telephone them at 231-861-2165, or visit them online at www.shelbygemfactory.com.